To Cite: Dadkhah M, Aghamohammadi A, Movahedi M, Gharagozlou M. Atopic Manifestations: Dermatitis, Allergic Rhinitis and Asthma in Patients With Hypogammaglobulinemia, Iran J Pediatr. 2015 ; 25(5):e2786. doi: 10.5812/ijp.2786. Background: Most of the hypogammaglobulinemic patients have a clinical history in favor of allergic respiratory disease. Nevertheless, in these patients the importance and prevalence of atopic disorders have not been completely explained. Objectives: This study was aimed to evaluate atopic manifestations (dermatitis, allergic rhinitis and asthma) and pulmonary function in patients with hypogammaglobulinemia. Patients and Methods: We used the international study of asthma and allergies in childhood (ISAAC) questionnaire in forty-five patients diagnosed with hypogammaglobulinemia and spirometry was done in 41 patients older than 5 years. Results: Spirometry results were normal in 21 (51%), and showed obstructive in 15 (37%) and restrictive pattern in 5 (12%) of the 41 patients who were evaluated. By the end of the study, asthma was diagnosed in nine (20%) patients and other atopies (rhinitis and dermatitis) identified in 10 (22%), and four (9%), respectively. Conclusions: Atopic conditions should be investigated in the hypogammaglobulinemic patients and the prevalence in these patients may be higher than in normal population. Also, it is recommended to perform a pulmonary function test as a routine procedure in patients with hypogammaglobulinemia and atopy should be assessed in these patients. Common atopic manifestations, including allergic asthma, allergic rhinitis and atopic dermatitis are seen in patients with primary immunodeficiencies (PID). The most common PIDs include common variable immunodeficiencies (CVID), X-linked agammaglobulinemmia (XLA), and hyperimmunoglobuline M (HIGM) syndrome (1-7). A clinical history suggestive of allergic respiratory disease is ascertained in many of the patients with hypogammaglobulinemia. Nevertheless, in such individuals, the prevalence of asthma and the role of atopy have not been easily demonstrated (2). Few studies pointed out pulmonary non-infectious disease (PNID) in hypogammaglobulinemic patients. Indeed, infection is the most common cause of complications in these patients (6). Moreover, evaluating atopy in these patients is difficult. Respiratory symptoms in hypogammaglobulinemic patients might be a manifestation of infectious complications or respiratory allergic reaction. Unfortunately, hypogammaglobulinemies especially CIVD have delayed diagnosis (8). Asthma has high and different prevalence worldwide (2). The prevalence of asthma in Brazilian adolescents is 29% (9), in Chinese children and adolescents it is 3.4% (10) and in Tehran, the capital of Iran, it is 35.4% (11). The aim of this study was to assess the atopic manifestations including dermatitis, allergic rhinitis and asthma and performing pulmonary function test in hypogammaglobulinemic patients. In a prospective study a sample of 45 patients with hypogammaglobulinemia (CVID, XLA, and HIGM) referred for intravenous immunoglobulin (IVIG) therapy between January 2011 and March 2012 to the department of immunology and allergy of Children’s Medical Center was studied. The demographic characteristics of the patients are shown in Table 1. All patients met the criteria for a diagnosis of hypogammaglobulinemmia. In patients with CVID, presenting serum levels of IgG, IgA and IgM were below two standard deviations of the age-specific normal value, and these patients were unable to synthesize specific antibodies (12). Diagnostic criteria for HIGM were serum IgG concentration below two standard deviations of the age-specific normal value, and mutation in the CD40L gene. Criteria for diagnosis of XLA were male patients with less than 2% CD19 B cells and mutation in Btk (13). After enrollment, International Study of Asthma and Allergies in Childhood (ISAAC) questionnaire (14) was filled for all patients. Assessment of atopic manifestations including allergic asthma, allergic rhinitis, and eczema was done with ISAAC questionnaire and for evaluation of asthma in patients older than five years old, spirometry was done. Spirometry findings were therefore classified as follows: normal; obstructive lung disease (OLD); or restrictive lung disease (RLD). To determine the severity of obstruction, patients with obstructive patterns classified into four groups according to FEV1 (forced expiratory volume in one second). Increasing at least 12% and 200 mL in forced expiratory volume in 1 second (FEV1) or forced vital capacity (FVC) or at least 20% in MEF25-75 was considered as a positive response to bronchodilator agents (2). Patients were informed of the study procedures, including the proposed tests. All participating patients then gave written informed consent. SPSS Inc. for Windows standard version 19 was used for statistical analysis. Forty five eligible patients were enrolled in the study. Atopic manifestations in patients with hypogammaglobulinemia are shown in Table 2. These findings were obtained from ISAAC questionnaire. Table 3 shows spirometry results in patients with hypogammaglobulinemmia. Normal pattern was the most common (51.2%) spirometric pattern. Prevalence of obstructive and restrictive pattern was 36.6% and 12.2%, respectively. Obstructive pattern was more common (19.5%) in patients with CVID than in patients with XLA (9.8%) or HIGM (7.3%). Table 4 shows the severity of obstruction in patients with obstructive patterns according to FEV1. Of 15 patients with obstructive lung disease, 8 patients (53.3%) had mild, 3 patients (20%) moderate, 3 patients (20%) moderately severe and one patient (6.7%) extremely severe obstructive lung disease. Response to bronchodilators was evaluated in patients with obstructive patterns; five patients (25%) of 20 patients with CVID had positive response to bronchodilators. Two (22.2%) patients of 9 patients with HIGM and two (16.6%) patients of 12 patients with XLA had positive response to bronchodilators. According to the previous studies by questionnaire in different parts of Iran, the prevalence of asthma in children is about 8% - 12% (15-17). Allergic disease and primary immunodeficiency can occur concurrently. The surface of the respiratory, genitourinary and gastrointestinal tract is expanded, so the pathogenic microorganisms can invade the body from these surfaces. Secretory IgA has a significant role in protecting the body via interaction with special immune modulators and receptors. Secretory IgA acts as an important antibody in controlling allergic symptoms. It limits the allergens to the lamina properia so decreases the inflammatory response (18-20). Atopic disease is reported in 50% of children with selective IgA deficiency (SIgAD). There is an increased rate of asthma and allergic disease in patients with decreased serum levels of IgA and IgG subclasses and secretory salivary IgA. In patients with SIgAD, recurrent airway inflammation is the most common clinical problem. Hence, recurrent infections are not only due to immunodeficiency but also an allergic background has an important role in clinical manifestation (21). This study was done to extend our knowledge about atopies in hypogammaglobulinemic patients and early diagnosis of asthma in these patients. Atopic manifestations, including wheezing, allergic rhinitis and eczema should be evaluated in patients with hypogammaglobulinemia. In this study, wheezing was the most common (60%) atopic manifestation in hypogammaglobulinemic patients; allergic rhinitis and eczema were 22.2% and 8.9% respectively (Table 2). In the study of Yartsev et al. (1), atopic dermatitis was the most common atopic manifestation in patients with primary immune deficiencies. In the study of Llobet et al. (22), allergic rhinitis and atopic dermatitis were seen in 11 (50%) patients of the 22 patients with CVID. In brief, of the 21 patients with CVID, spirometry was performed in 20 patients older than 5 years and of the 20 patients, 10 (50%) patients had normal spirometry, 8 (40%) patients had obstructive lung disease, and two patients (10%) had restrictive lung disease (Table 3). Of the 8 patients with the OLD, 4 (50%) patients had mild (FEV1 ≥ 70%), 2 patients moderate (FEV1 60 - 69%), one patient (12.5%) moderately severe (FEV1 50 - 59%) and one patient severe (FEV1 35 - 49%) lung disease (Table 4). In comparison with the findings of other studies spirometric results, especially in obstructive patterns were similar to the findings of Agondi et al. (2), and Ogershok et al. (23). In our study, of the 15 patients with XLA, spirometry was performed in 12 patients older than 5 years. Of the 12 patients, 7 (58.4%) patients had normal spirometry, 4 (33.3%) patients had obstructive lung disease, and one (8.3%) patient had restrictive lung disease (Table 3). Of the 9 patients with HIGM, 4 (44.5%) patients had normal spirometry, 3 (33.3%) patients had obstructive lung disease, and 2 (22.2%) patients had restrictive lung disease. In the study of Costa-Carvalho et al. (24), for evaluating pattern in 30 patients with CVID and XLA, obstructive lung disease was discovered in 38.8% of the patients, restrictive lung disease and mixed pattern in 44.5% and 16%, respectively. In CVID patients, chronic rhinitis may be a manifestation of allergic disorders, and personal and family history of atopy may be discovered in significant number of them. We found that, of the 21 patients with CVID 6 (28%) patients had allergic rhinitis and 4 (19%) of them had rhinoconjunctivitis. In comparing with study of Agondi et al. (3), the prevalence of allergic rhinitis in our patients was lower (28% in our study in comparison with 43% in their findings). In hypogammaglobulinemic patients, because of recurrent respiratory infections asthma may not be diagnosed and asthmatic patients are easily influenced by respiratory infections, and it can last a long time, which might postpone a possible diagnosis of humoral immunodeficiency. Like IgA deficient patients, the mucosal immunodeficiency is seen in hypogammaglobulinemic patients and this can cause the allergic reactions to allergens, inflammation, bronchial hyper-responsiveness, and consequently, asthma develops easier (2). On the other hand, mucosal breakage by the infections may have an important role in more accessing and uptake of antigen in these patients. Also, there are some systematic reviews which provide insights into the positive role of early-life antibiotic use in development of asthma and allergic diseases (25, 26). From this point of view, most of the hypogammaglobulinemic patients may have more chance of developing asthma and allergy because of frequent infections and recurrent antibiotic use in the first year of life. 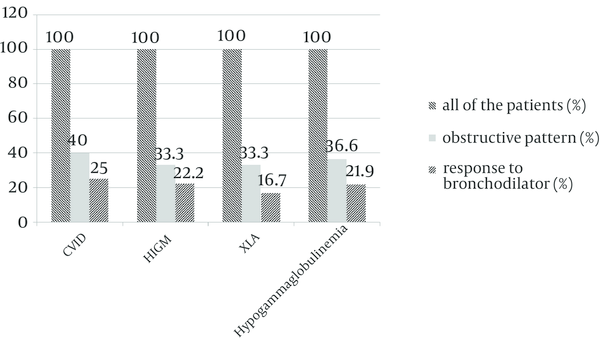 By the end of the study, for diagnosis of asthma in patients with hypogammaglobulinemia, response to bronchodilator in patients with obstructive pattern was evaluated. Five (25%) patients of 20 patients with CVID had positive response to bronchodilators. Two (22.2%) patients of 9 patients with HIGM and two (16.6%) patients of 12 patients with XLA had positive response to bronchodilators. So we should perform a pulmonary function test as a routine procedure in patients with hypogammaglobulinemia and atopy should be assessed and treated in these patients. This study was done just by using ISAAC questionnaire, and further data may be added by using skin prick test as a supplementary test for detection of specific IgE in the patients, which is suggested for future studies. The authors would like to thank patients, their families and Allergy and Clinical Immunology Department of Children’s Medical Center staff for their cooperation in this study.